For about the past 2 years now I’ve really been getting into drinking green smoothies. A bit strange to get used to I know but trust me..they do amazing things! When you drink your greens they are already blended up therefore the nutrients are absorbed by the body much father than if you had to chew them, let your stomach break it down and then reap the benefits. My recommendation is to ease into it. 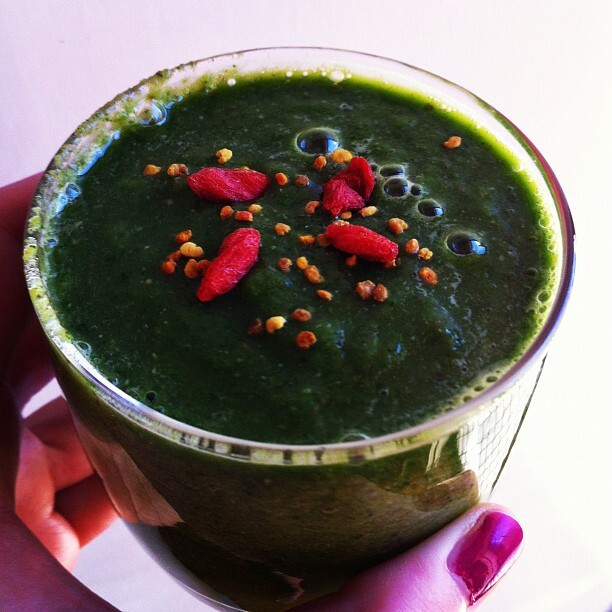 Drinking spinach, kale or silverbeet doesn’t appeal to everyone. I suggest adding a handful of spinach and working from there. Increase your greens on a weekly basis until you are used to the taste. The more fruit such as apples and oranges you add the sweeter and easier it’s going to be to chug it down. For the smoothie featured below I used Apple, Orange, Silverbeet, Cucumber, Mint, Ginger, Spirulina, Chia Seeds and Dates and blended it up with a bit of filtered water and ice. You could also use coconut water or a nut milk as a base if you prefer. Give it a go. Experiment. Share your recipes!